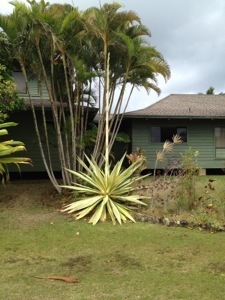 This entry was posted in Flora & fauna, Kauai and tagged agave, Kauai by kauaigreenhorn. Bookmark the permalink. I thought agave was to make tequila? I need a Mai Tai. Interesting how on the ball you are when it comes to all things alcohol, Erich! 😉 You are of course absolutely correct, but that’s specifically the aptly named tequila agave or blue agave, http://en.wikipedia.org/wiki/Agave_tequilana. Sadly this is not one of those; it’s an agave angustifolia, http://en.wikipedia.org/wiki/Agave_angustifolia (and no, it’s not used to make angostura bitters).